The first sponsor for the It's Your Love Event is EdenFantasys'. I got to review the Happily Ever After Whipped Body Creme from EdenFantasys'. When I picked the body creme I was expecting to get a small jar of creme but I was pleasantly surprised by it's size when it arrived. I was also worried about how strong the scent would be and if it would bother my asthma. I must say that at first I did not like the strong scent. It smelt like Honeysuckle to much for my taste, but after I applied it; it smelt more like grapefruit which smelled very good. 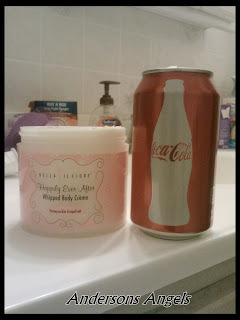 I really like how rich and creamy this body creme is. When I opened it; it looked like cool whip and feels like satin. I like that it doesn't leave your skin feeling oily either but instead nice and smooth. I hate when I put on lotion and my hands feel greasy and oily afterwards. I love having soft and smooth skin but with winter here my skin is very rough and dry at the moment. I have the same issues, I can't have a strong scent because of my asthma but that is hard to come by these days. Thanks for the review, I should check this out. My skin is so dry right now! I am applying lotion like crazy. Ian need to give this a try. This looks really good. 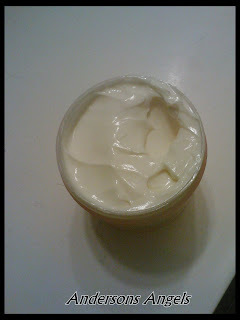 I love body butters. I have so many already, but I really want to try this one! I could definitely use a good moisturizer these days! This cold weather is making my skin super dry.